Plastic shielding could help protect astronauts from harmful radiation on long journeys through deep space, new observations from a NASA moon probe suggest. 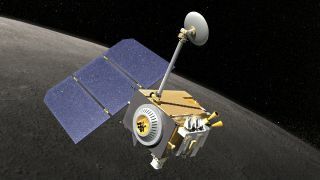 An instrument aboard NASA's Lunar Reconnaissance Orbiter (LRO) found that plastic reduces the radiation dose from fast-moving charged particles called galactic cosmic rays. Scientists have long suspected that this is the case, but the new results provide a vital confirmation in deep space, researchers said. Galactic cosmic rays are tiny, super-energetic wrecking balls blasted into space by distant star explosions and other dramatic events. Earth's atmosphere and magnetic field deflect most of these particles away, so those of us on the planet's surface don't have to worry too much about them. But astronauts — especially those in deep space, beyond the planet's magnetosphere — are much more exposed. NASA and scientists around the world are trying to figure out the best way to shield astronauts on long-duration missions, such as journeys to Mars. Aluminum, the main material in spacecraft construction, does virtually nothing to stop galactic cosmic rays. Computer models and ground-based experiments using particle accelerators suggested that plastics are much better, and LRO took this idea to space. LRO has been zipping around the moon at an altitude of 30 miles (50 kilometers) since 2009. Its Cosmic Ray Telescope for the Effects of Radiation instrument, or CRaTER, gauged the radiation dose from cosmic rays after the particles passed through a material called tissue-equivalent plastic, which is designed to mimic human muscle tissue. "The shielding effectiveness of the plastic in space is very much in line with what we discovered from the beam experiments, so we've gained a lot of confidence in the conclusions we drew from that work," Zeitlin said. "Anything with high hydrogen content, including water, would work well." But shielding alone cannot entirely solve the deep-space radiation problem, Zeitlin and others say. Indeed, NASA is working to develop advanced propulsion technologies such as nuclear fusion rockets, which would reduce radiation exposure by slashing travel times to faraway destinations. Galactic cosmic rays pose the most serious radiation problems for deep-space explorers, but other sources contribute as well. Solar storms, for example, routinely eject particles that are less energetic but can still damage tissue. The new study has been published online in the journal Space Weather.